Attending a trade show can be an excellent marketing and sales opportunity for your business, whether you are an entrepreneur or you are representing the company for which you work. Yet, many people don’t know how to take full advantage of the multitude of benefits that show involvement offers. Some plan on simply going, setting up their trade show booth, and then staying there all day hoping to attract new business. Manning a trade show display is only part of the reason for attending a trade show. Other vendors at the event can provide you with a wealth of new information and contacts in your industry – all accessible in the same room on the same day. This is the unparalleled attraction of trade show participation for your business. If you plan on attending a trade show, make sure you are not the only person there representing your company, even if you are a small business owner with few employees or a sole proprietorship. You will need at least one person to staff your trade show booth, and another to walk the floor taking in the other trade show displays. If necessary, get your spouse or a good friend to come with you and give them a crash course on how to handle your trade show booth while you check out the other vendors – and only do so when it is slow so you don’t miss important business opportunities. When you make reservations for the hotel you will stay at during the show, try to find a room as close as possible to the actual location -- preferably within walking distance. That way, you won’t have to bring anything with you to the venue other than the materials for your trade show display. Before attending a trade show, go over the list of exhibitors who plan to put up trade show booths. Make lists of those you want to see, would like to see, and can live without seeing. You may even be able to schedule appointments with your top-priority exhibitors. 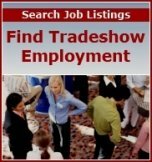 Research the companies and determine ahead of time what you would like to find out by visiting each trade show display. Identify your goals based on whether companies are competition or a potential contact. If they are a potential contact, how would they specifically benefit your company? Have questions ready to ask exhibitors to save yourself time walking the floor. Another good time-saving strategy when attending a trade show is to obtain a map and a directory of exhibitors before you arrive on location. Use the map to plan your route, and check your prioritized list of vendors against the directory to find out whether any vendors have been added or dropped out. During the trade show, be active in your quest for information. Don’t feel bad about passing by booths that don’t interest you. Like you, they are attending the trade show to generate new business, and they don’t want to waste time talking to someone who isn’t a potential customer. Visit your targeted trade show displays, engage in a dialogue with the exhibitors, and ask questions. If handouts, samples or other materials are available, take only those you actually want. It can be difficult to tote a loose stack of glossy brochures, catalogues, and bulky product samples around a busy trade show floor. If possible, arm yourself with an empty briefcase or duffel bag to stow materials. Use your time wisely to gather intelligence on your competition and make new industry contacts that will benefit your company. When the trade show ends, especially if it is a multiple-day event, take the time before you leave to make notes and organize the materials you gathered from attending the trade show . If you need to follow-up by emailing or mailing reports, brochures or other materials to colleagues, prepare the communications right away while "who gets what" is still fresh in your mind. Make sure to store your trade show display safely so nothing is damaged and you can find everything you need the following day. When you return from the trade show, plan how and when you will stay in regular contact with the people you met. This communication may include regular calls, visits, social media, email and mail. At the same time, start preparing for next year’s trade show.